Montreal's Chinatown may be modest in size compared to those in Toronto and Vancouver but it doesn't seem to matter to locals who keep coming back to this tourist-designated pedestrian district for its specialty shops, trending bars, its ambiance in Sun Yat-Sen Square, its seasoned fortune tellers, and of course, the food. Click through this slideshow to discover Chinatown's pedestrian center and its quirky shopping, nightlife, and must-eat destinations. Montreal's Chinatown is admittedly tiny, a modest L-shaped district sandwiched between Quartier des Spectacles and Old Montreal. Four friendship arches with stone lions at each base roughly delimit its boundaries. The closest subway station to Chinatown is Metro Place d'Armes. Given the diminutive size of the neighborhood, there aren't exactly dozens of nightlife options. Le Mal Nécessaire is the district's resident tiki bar (and one of its only bars, period), an eccentric hot spot filled with cool kids, creatives, and hipster types. Think drinks served in hollowed out pineapples and coconuts. Never tried dragon beard candy before? No worries. Most people haven't. It's an ancient confection that's hard to find outside of the motherland dating back to Imperial China that was almost wiped out by Communism. By the late '80s, only a handful of dragon beard candy masters were left in the world. And by the early '90s, one of them opened a stand in Montreal's Chinatown, the first place in North America to sell the hair-like candy. Keep an eye out for Johnny Chin's stand in the heart of Montreal's Chinatown on rue de la Gauchetière Ouest near the corner of Clark. Chin makes them fresh on the spot, with each candy composed of 8,192 paper-thin strands created in the span of 40 seconds then wrapped around a crunchy center of ground peanuts, chocolate, coconut and sesame seeds that, when eaten fresh, combines with the melt-in-your-mouth "dragon's beard" to form a chewy, nougat-like mouthfeel and flavor. Remember to eat them within the hour. Or better yet, immediately. It's the only way to experience that cotton-candy-turns-to-nougat alchemy. Hotels in Montreal Chinatown? There's the Holiday Inn, one of the area's most recognized buildings if only for its rooftop pagodas. And there are these choice hotels near the Montreal convention centre Palais des congrès, the latter a stunning landmark in its own right located on the western edge of the neighborhood. Bao buns, Chinese BBQ pork buns, sweet mochi, moon cakes, and every other baked confection Chinese bakeries come up with make for some of the best cheap eats you could dream up. In Montreal's Chinatown, the two best in show are Harmonie Bakery and its superb red bean filled sesame balls, salty and sweet baked buns with various fillings -beef curry, hot dog, custard, chicken, BBQ pork-- as well as its significant selection of glutinous mochi. And its neighbor, Bao Bao Dim Sum, makes some of the best savory buns in the city. Try the freshly steamed mixed vegetables bao and the Chinese mushrooms and chicken buns. Both are on de la Gauchetière Ouest near the corner of St. Urbain and neither feature seating arrangements. Either walk west on de la Gauchetière Ouest and sit in Sun Yat Sen Square for a purely Chinatown ambiance or go east toward the quieter garden area behind Palais des congrès (unless there's a major public event, then it'll be crawling with conference attendees). For the freshest, made-from-scratch noodles in Chinatown, try the hole in the wall that is Nouilles Lao Tzu on boulevard Saint-Laurent south of de la Gauchetière Ouest. The space is tiny and there's not even a bathroom—go next door to Swatow Plaza for access to its public bathrooms if you really need to go—but that doesn't stop locals and travelers from dropping by for a taste, or to check out staff making noodles by the window. Lao Tzu's soup bowls are huge. And vegetarian options are available. 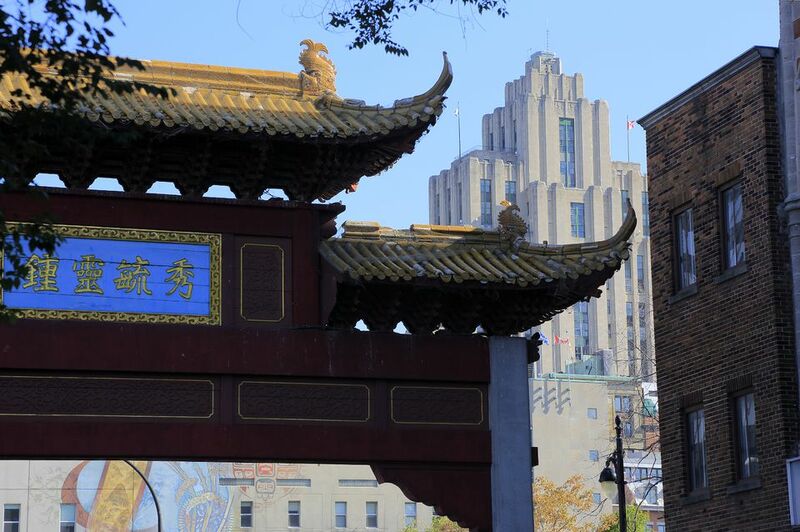 Sun Yat-Sen Square is Montreal Chinatown's epicentre, just blocks away from the Palais des Congrès and Complexe Desjardins on Clark at the corner of de la Gauchetière Ouest. On a nice day, buy some edible goodies and eat them in the square. Montreal Chinatown shops are typically cluttered with eye-catching knick knacks, artwork, paint brushes and assorted art supplies, housewares, lanterns, jewelry, tea, clothing, foodstuff, and accessories. In a close second in the late-night Cantonese department is Tong Sing, open every night including Sunday until 4 a.m.
And pho fanatics love Pho Bang New York on St. Laurent. The soup bowls are big and the grilled meats on point. Great prices too. But if there's too much of a lineup, cross the street and head to Pho Cali. The only difference is the meats are not quite as quality as at Pho Bang New York. But they're still good. Montreal Chinatown celebrates the Chinese New Year in either January or February with a lion dance on the closest Sunday. In the summer, select businesses observe Hungry Ghost Festival during the seventh month of the Chinese Lunar calendar year. Spirits of the dead are believed to be released from hell at that time, restlessly roaming the earth. Believers appease said spirits with money, food, and live entertainment. And of course, in the fall, bakeries like Patisserie Harmonie celebrate Mid-Autumn Festival with traditional mooncakes, a dense calorific pastry filled with egg yolk and lotus seed paste. But if there's an annual event that attracts the masses, it's the quintessential street fair. In the case of Montreal's Chinatown, three sidewalk sales are held in the summer, three weekends in June, July, and August. Dragon Beard Candy: What Is It, Where Is It and How Do You Make It?